The rigging, rigging and sails of ships of the XVIII century Marquardt K.Kh. Oh my gosh thank you. There is a wealth of information in there. Fortunately someone documents this knowledge or it would surely be lost. Much of this will be very helpful for future builds and certainly some now. 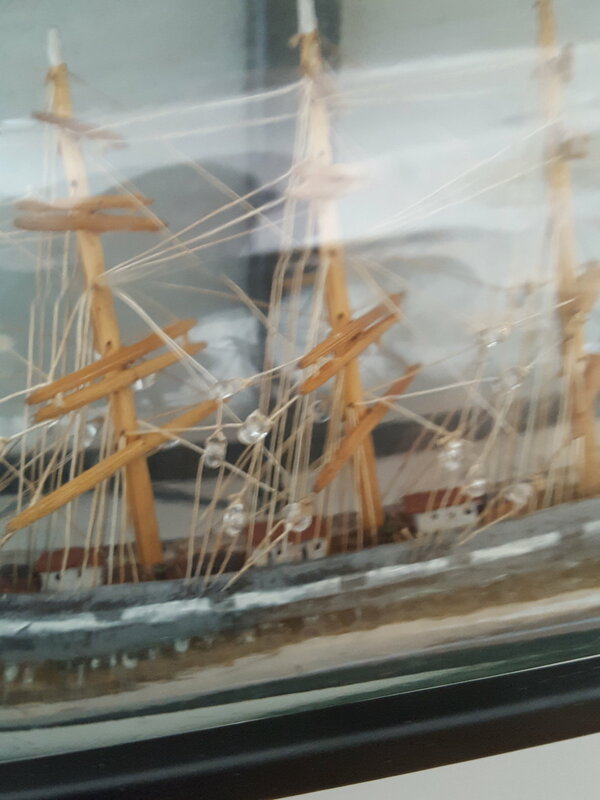 My concern is the rigging adaptation necessary for placing the ship in the bottle. Things that wouldn't be required for a real ship, but must be done for a SIB in order to facilitate it's bottle entry. I hope that makes sense. Some pictures of different rigging. It looks like most of these have rigging from the ends of the yards triangular shaped back to the mast behind. From the yard ends to the hull they seem to be just the lower yards, not the one higher ones. I hope I am right that the rat lines are fixed and OK as long as they are behind mast. 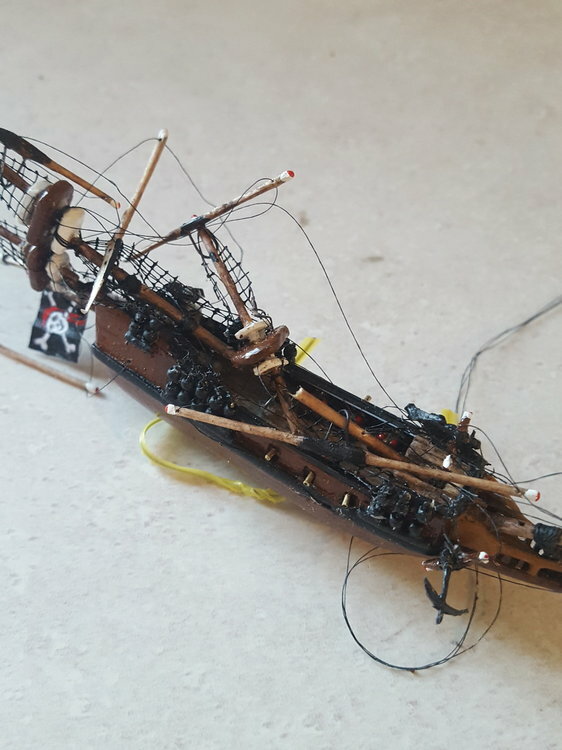 Does each mast generally need a line through the bowsprit to pull up, or is it OK to use one line to pull up multiple masts? Here's a rigging plan that's very similar to your ship. 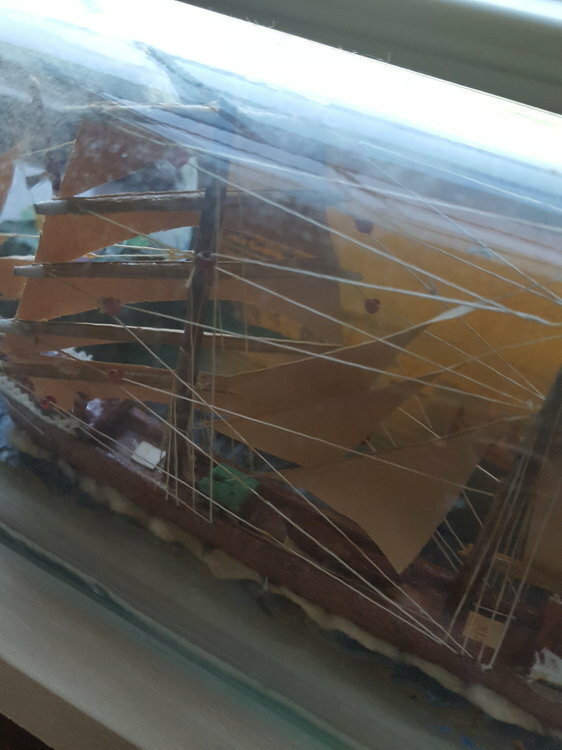 There's a lot of different way to rig a ship in a bottle. One of my favorite techniques to use in rigging I learned from John Fox III. It's called the thread block. Here's a link to the video on it. Basically it's tying a string around a needle to create a small loop and then gluing the knot so the loop doesn't close. These loops can be used all over the ship to run lines through. The alternative to this is seed beads. They are bigger than thread blocks but as you've seen from the other photo's you've found they do work well. When I'm not going for a super crazy accurate look on running rigging I take a simplified approach. There's three parts lifts, clew lines and sheets/braces. The lifts which run from the tip of the yardarm to the mast I think are optional. Some sibs have them, many more don't. I think they look nice but including them is up to you. To rig them in the bottle I use a thread block attached to the mast above the yard arm. I then tie a line to the end of the yard thread it through the block and tie it to the other end of the yard. The yard should still be able to turn almost parallel to the mast even with this line in place. That makes it possible to insert it into the bottle and there's not a lot of messing with the lift once it's in. Just adjust the yard and if needed put a dab of glue on the thread block to keep it all in place. Clew lines are attached to the end of the yard arm and have a block on them. The braces run from the hull through the clue lines and back to the hull. These are typically used on the bigger yard arms. Note the smaller yard arms higher on the mast don't have clew lines. This is where a thread block or seed bead comes in handy. Attach a line to the end of the yard that has a thread block or seed bead on the end. Sheets typically run towards the back of the ship. 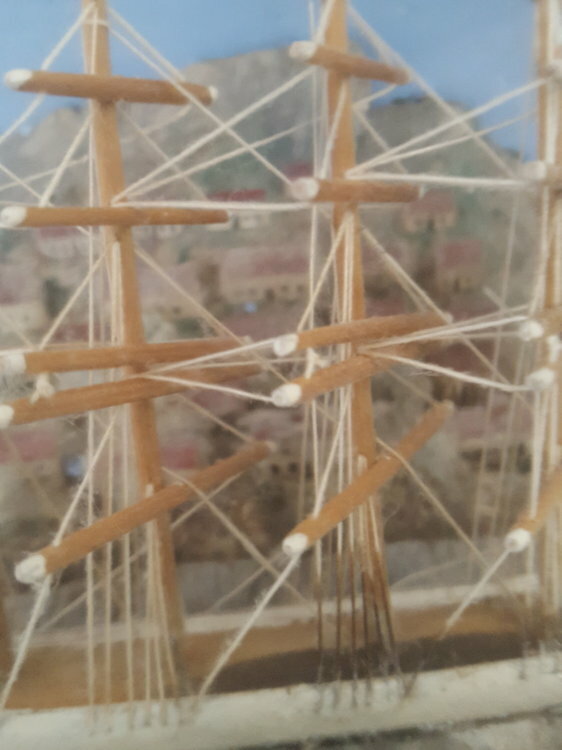 This is advantageous to the folding method since the lines can be put in place and as the masts fold backwards the lines become loose and then tighten up as the masts are pulled up into place. This does require a lot of testing though. Typically the sheets running through the clew lines run farther back on the ship and can be glued down to the hull. The sheets in the upper yards are trickier. On a real ship these lines often run to the fore stays and then down to pin rails on deck or on the bulwarks. That is hard to replicate on a ship in bottle. The simpler method is to run them to the mast aft of the yard arms. 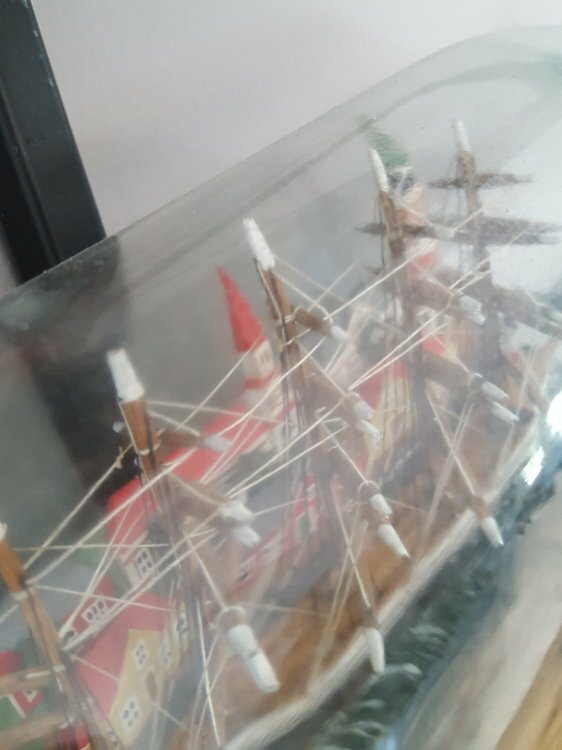 Older ships in bottles would drill a hole in the mast and run a line through it similar to what I explained with the lifts. If done right you can still fold the masts back using this method. I use a similar method except I tie a thread block to the mast. drilling holes in the mast makes them weaker and risks a break. Tying a thread block gives the same effect with out effecting the integrity of the mast. You can also run the sheets so they run out of the bottle and can be tightened after the ship is in. It depends on what you want to accomplish and how you design the ship to fold and unfold. Another method I use is to get a paint brush bristle and glue it to the end of the yard so that it just touches the mast behind that yard or vise versa. Once the ship is in you can glue the other end in place. Look at my build of the Scavenger as an example. I hope this helps. Ask more questions if needed. For me the phrase 'less is more' springs to mind with regards to rigging. 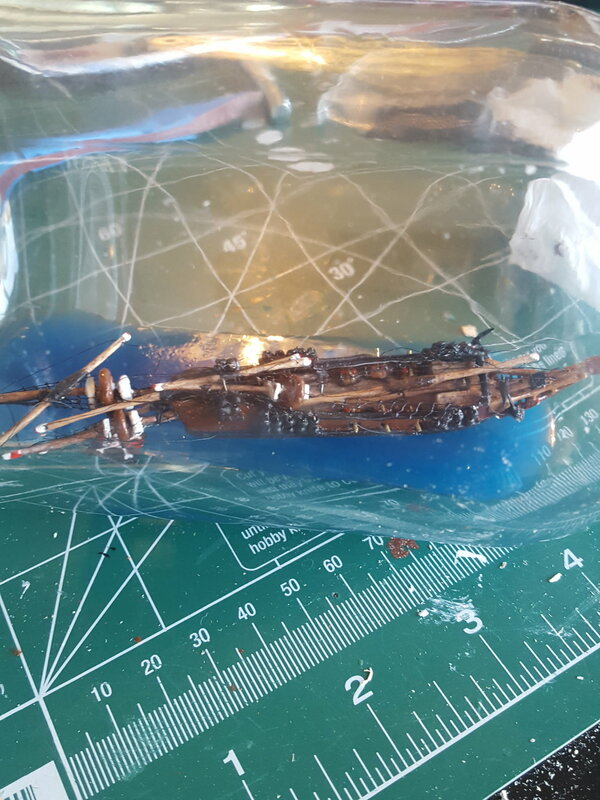 In other words a lot of rigging on a small model ship going in a bottle can look over produced and a bit top heavy but that is just my own opinion. I agree Oni. 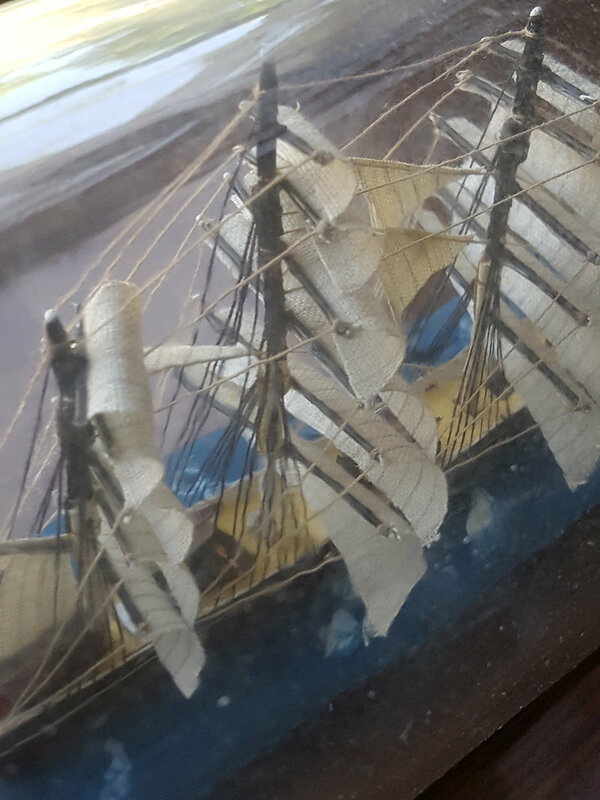 I often think ships in bottles are part model and part painting. You don't need to put in every line. Just enough to convey the idea. Most details go unnoticed any way. Probably one out of ten people notice I put seagulls in some of my bottles. Here is a zipped file of an incomplete rigging primer I started. I only got through most of the standing rigging, but it might be helpful. The article is written as though it were a web page, i.e. you unzip the files into a folder, then use whatever internet browser you normally use to open/view the .html file in that folder. I tried to explain the "why's" for individual lines in general terms that can be applied to most modeling situations. 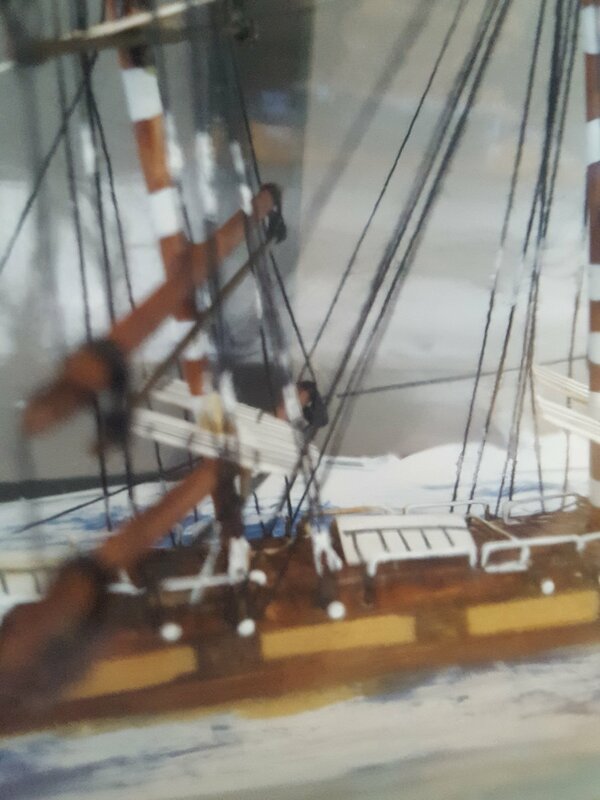 Also, while modeling methods and desires vary by person, the way I look at rigging, and many other ship parts and pieces, is to use a scaled print and photographs or paintings, if available, to look at what you can actually see. If I can see certain items, including rigging, on a scaled drawing or image, then I add it to my models. Running rigging is also useful to maneuver yards/booms/gaffs/etc. 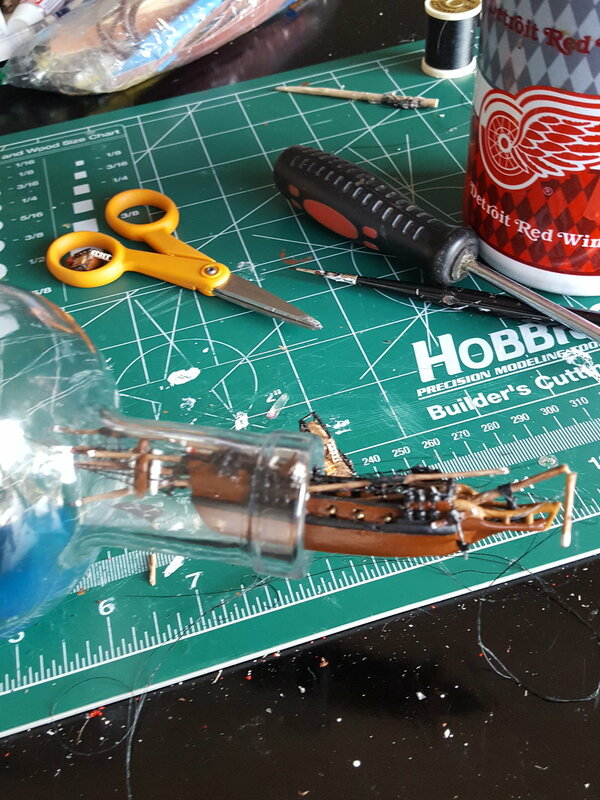 into proper final position without reaching inside the bottle with a tool that might cause damage to some other parts of the model. It does add more "control" lines, those operated from outside the bottle, I prefer that method to using tools to do the work inside the bottle. Thank you all for the wealth of information, it's appreciated. 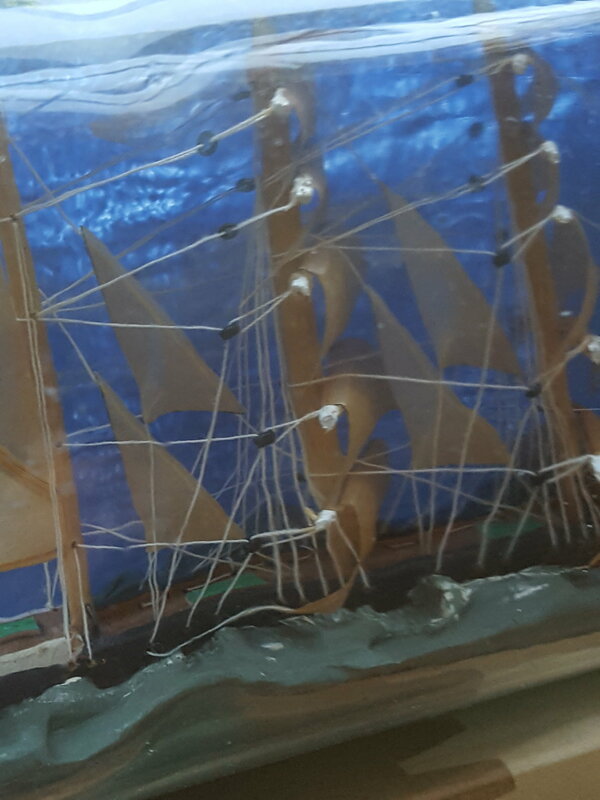 I wrestled with sails or not, but I think for this "learning" project I will leave them out. I have put holes in the masts and yards that are perhaps not optimally placed as well as a few other rookie mistakes that concern me. I really like the video of blocks and the reduction in risk to those pieces that would otherwise be weakened. I have learned a bit more time spent in the planning stages will greatly reduce time and frustration in the later phases of the build. My 1p worth that may help. These are from the Black Pearl plans I drew up. I did not use them all in the end. Excellent pics and Video by John. All... if you guys have a technique or modeling ideas to share please do not hesitate to send me a quick email with them in a word or PDF document so we can share them this December in our Bottled ShipWright Journal. I will ensure to insert the link to John's video in the journal. This is the kind of stuff I am looking for. P.S. the journal will be free and please hit the clubs tab next to the Leader Board near the top of the page to join. See attached snip! Spent a couple weeks in Key Largo and was looking forward to getting her in the bottle. Unfortunately things did not go as planned. Starting with the bowsprit, broken, repaired, advanced, disaster! ...back to the drawing board. On the positive side I am sure you can fix it and get her back in the bottle where she belongs.? Thats never fun. You got this though. I look forward to seeing her sailing in the bottle. My sympathies. I've been there as well. Take the opportunity to modify, and make better as well as repair, and don't rush it. Its all a learning experience. I done exactly the same with my last build, don’t be put off, just remember, a bit of glue as good as new! ?